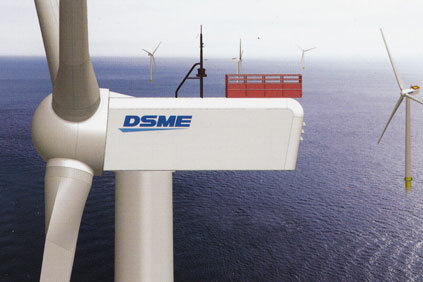 KOREA: Daewoo Shipbuilding and Engineering (DSME) is set to join the list of manufacturers with a 6MW+ offshore wind turbine on the market. At EWEA 2011 Offshore DSME presented a new 7MW three-bladed medium-speed offshore turbine, which bears a resemblance to the latest Gamesa and Vestas offshore designs, is still in development. The IEC Wind Class IA turbine will be fitted with a 160-metre rotor, while product specifications indicate rated power at 11m/s. The drive system comprises a main shaft with two bearings, a two-stage gearbox, and medium-speed 3.3kV permanent magnet generator. DSME senior engineer Jae-Hyung explained: "Prior to the design phase start DSME conducted a drive system comparison. The main outcome was that the costs of energy [€ct/kWh/20 – 25 years] for direct-drive and medium-speed geared drive systems are roughly similar. "We chose a main shaft with two-bearing solution as this limits risk of rotor-induced loads being passed on to the gearbox." Drive system choice and component layout resembles those of Gamesa’s G128-4.5MW and G128-5.0MW (offshore) sister turbine models. There are also similarities to the V164-7.0MW, which features a medium-speed drive system with likely three-stage gearbox and 164-metre rotor diameter. Regarding rotor-blade development DSME is speaking with blade manufacturers as well as blade design firms, Jae-Hyung added, without disclosing further details. Prototype installation is planned during Q1-2013. DSME’s product development fits into a comprehensive Korean industrial strategy aimed at becoming the world's third-largest country in terms of offshore wind power generation.